It’s been a while since I posted anything. Primarily that’s because I had the good fortune to go to Italy for a week to see my sister and her husband. As always, Italy is wonderful and so picturesque. It’s also very hard to paint. I’ve already become discouraged, but I will keep trying. There was a half finished painting on the easel when I left and I finished it while I was trying to get over jet lag from my return flight. I like it so I thought I’d share. I haven’t done too many waterscapes, and I’ve always been very unsuccessful with pictures of surf. On this one I had more success. 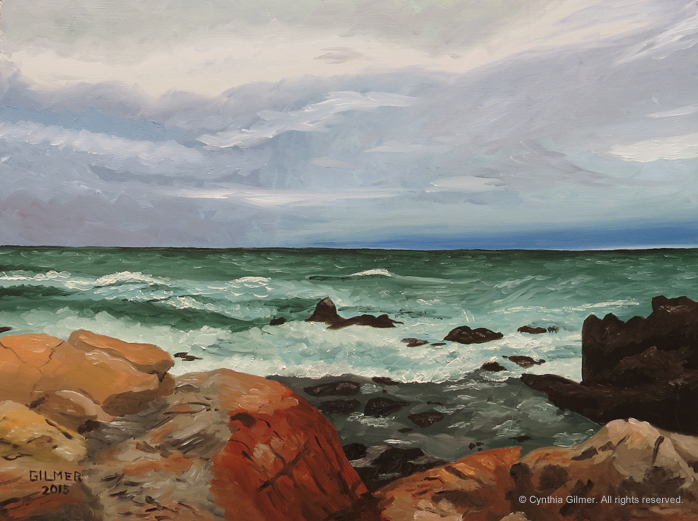 I painted it from a photo I took along 17 Mile Drive in Carmel California a few years back. It was a windy rainy April day and the skies were mean. I enjoyed capturing the different colors in the surf and the sky. The rocks, as always, were a challenge. I like the end result well enough. As is true with most paintings, it looks better in from a distance rather than in a close up photo. I’ve got many other things to share so I will try to write another post this weekend. I have two pieces appearing in the Falls Church Arts 12th Annual All-Members Art Show. The show runs from April 10th through May 17th at the FCA gallery located in ArtSpace Falls Church, 410 S. Maple Avenue, Falls Church, VA 22046. I was always challenged by skies, so lately I’ve taken them on with a vengeance and I feel like I’m seeing some success. 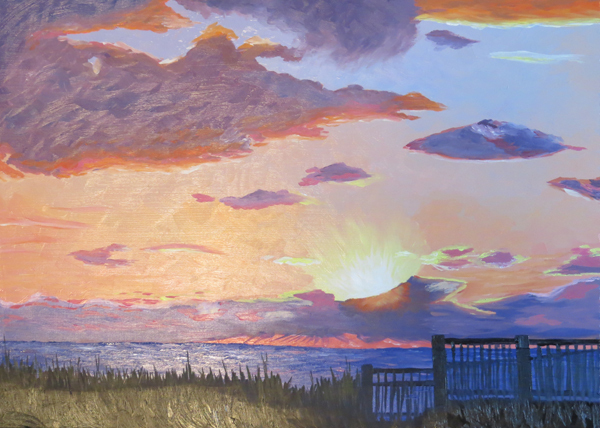 I was showing photos of some of my paintings to my friend Rob and he remarked that my skies were nice, so I have a second opinion. Part of the problem is my engineer’s brain. Sky is blue, clouds are white, and cloud shadows are grey, right? Nothing could be further from the truth. Once I got past that things got better. A couple of events helped me. One was seeing some paintings by a Bobbi Pratt, a local Northern Virginia artist. Bobbi does beautiful colorful skies. Second was the class I took from Andras Bality, who helped talk us through mixing our palette, pointing out the violets in the clouds. 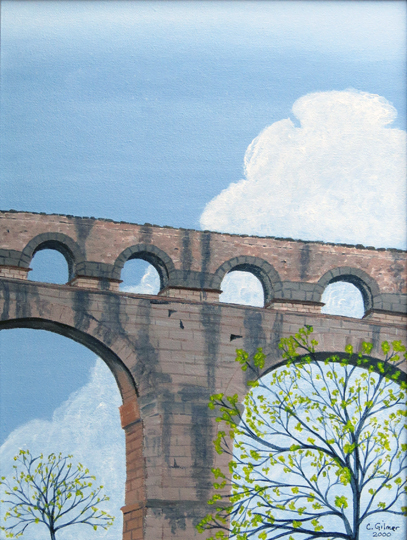 Back in 2000 I painted a picture of a photo I’d taken of the Pont Du Gard in the South of France. I always loved the painting, but I hated the cloud. I actually repainted this when I first started painting again last year thinking I’d get it right the second time. The cloud is better, but still not right. I might have to try again now that I’m getting seriously into clouds. Sunrises and sunsets have become some of my favorite subjects since I’ve been getting into skies. I’ve taken on some truly challenging scenes, and I’ve been pleasantly surprised by the results. Last spring we went to St. John, USVI for our anniversary and my husband took a stunning photo of the sunset from Zozo’s, a restaurant in the Caneel Bay resort. In an act of total bravery I decided to try to paint it and I’m so glad I did. It came out wonderfully. 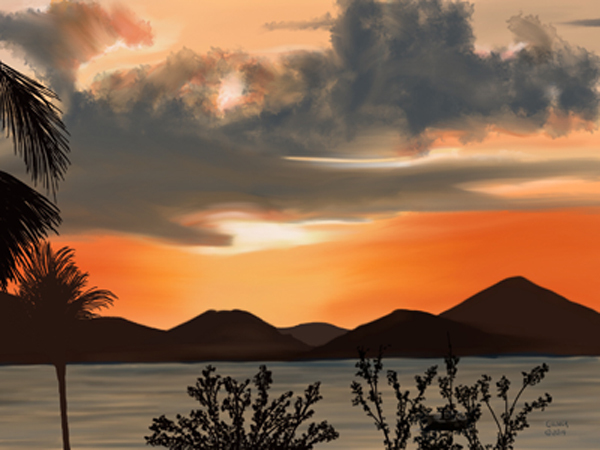 I ended up painting most of the clouds with my fingers because I couldn’t get the brushes to do what I wanted. I’ve learned more about brushes and how to select and use them since then. 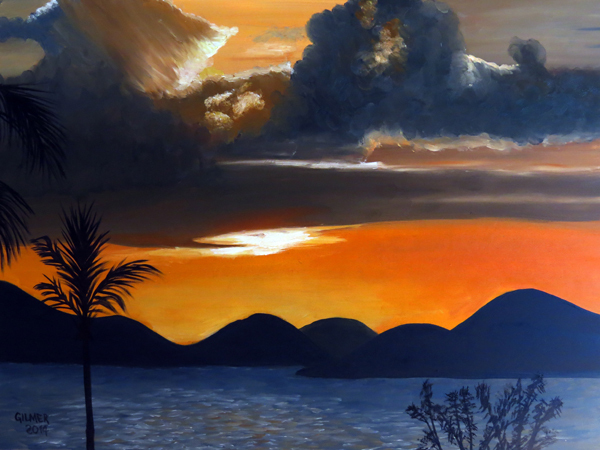 I remember after I finished the sky I was terrified to paint the palm trees for fear I’d screw it up. I didn’t. It’s one of my favorite paintings. I also did it on the iPad. The two ended up being sort of parallel studies for each other. I was doing the painting in our mountain house. I worked on the iPad version while I was in our Northern Virginia place. I finished the iPad version first. Last September I spent a week in the mountains and every morning I would walk to an overlook to photograph the sunrise. One morning the clouds were particularly luminescent. I decided to attempt a painting of that. I like the sky. I painted the shadows first and finished the highlights in pure white after everything had dried. I struggled a lot with the mountains and how they faded in the distance. It’s not a favorite, but ultimately I like the result. I’ve already posted my painting of the clouds lying in the valley, but this one was great fun. I thought about naming it clouds from both sides 🙂 What’s nice about this one is that the photo almost appears to be black and white except for the streak of orange-yellow sky in between the layers. I tried to make the colors, except for that streak, very subtle to keep that black and white feeling. I’m thinking about painting this one again in a larger size to go over my fireplace. That thought makes me nervous. I’m not sure I could do it as well a second time around. Most recently I decided to try a sunrise picture I took several years ago on the North Carolina shore. This is still a work in progress and I’m not sure how I feel about it. The colors are great. I painted the sky and let it dry and then painted the clouds. This is good if you want sharp edges, but it isn’t good if you want things to blend. Some of these clouds have sharp edges but others are wispy. 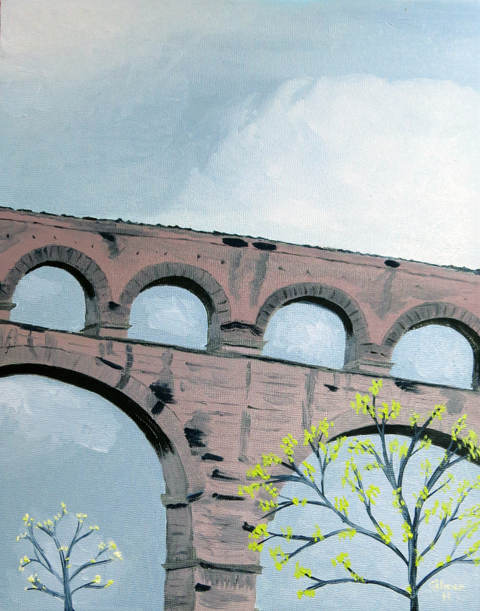 I had to repaint the wispy ones with part of the sky to get them to blend. There is also a cloud that looks a UFO. I still need to work on it. There may be hope for this, but I’m not sure. I’ll post the finished version if it’s any good.